On election night that “mole hill” turned out to be a mountain—of 76,00 votes and now to paraphrase 538, Anthony Brown has a 100 percent chance of being a spectator come inauguration day. Larry Hogan’s message of fiscal restraint and generating a stagnant state economy resonated with voters, while Brown’s lackluster campaign focused on negativity and scare tactics—a losing strategy for a candidate with support a mile wide and an inch deep. Brown’s base stayed home, while Hogan’s showed up to the polls. With a Republican Governor, and nine new GOP delegates the 2015 legislative session just got a whole lot more interesting. 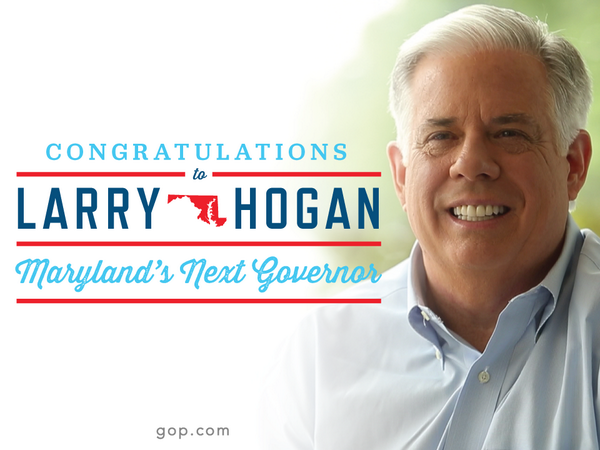 Larry Hogan: The 62nd Governor of Maryland, not only won, he won convincingly—by 5 points. He won by doing something different. Three years ago he began preparing the ground for his campaign message three years ago through Change Maryland. He started the contest of ideas—such that there was one with Brown—well ahead of the campaign. Larry defined the narrative of the campaign before it began. We are overtaxed, businesses overregulated, and our economy stinks. Larry now has a chance to change the arc of Maryland’s statist trajectory and expand the realm of economic freedom for Marylanders. Steve Crim: Hogan’s campaign manager was the architect of this historic upset and will surely be on the radar of other candidates looking for a smart campaign manager to make them a winner. Allan Kittleman: The former state senator pulled off the upset win in the Howard Count Executive race over Courtney Watson in a county that has increasingly trended Democratic. Kittleman will be just the second Republican executive in the county’s history. Steve Schuh: The former state delegate won handily, and is now the county executive of Maryland’s reddest county in central Maryland. Diana Waterman: Red Maryland has not been the staunchest of supporters of the MDGOP Chair. However she not only helped Hogan win, but also strategically targeted legislative races that helped the party gain 7-9 house seats and two in the Senate. Thanks to state party efforts, Democratic leaders of the House Appropriations Committee Norm Conway and Jim Bohanan are gone, along with Senator Roy Dyson. Nic Kipke and Kathy Szeliga: The minority leaders in the House of Delegates have a larger caucus to work with, and with a Republican governor, now have more leverage to work with than in the past. Heather Mizeur: She mortgaged some of the class with which she conducted herself in the Democratic primary with her hold-your-nose endorsement of Brown, but she was a force in the Democratic primary—just ask Doug Gansler. She could very well be the Democratic standard bearer in 2018. Mike Miller: Come session he could very well be last man standing of the O’Malley era Democratic machine. He only lost two seats in his house and will be the man leading the Democratic opposition to the Hogan administration’s initiatives. Red Maryland: After all, we did jump on the Hogan bus—enduring many slings and arrows—before he officially announced his campaign and long before he had a bus. Anthony Brown: He continued the trend of Maryland Lt. Governors failing to ascend to the top post. Brown’s negative, cloistered campaign, and lack of a vision—beyond satisfying the Maryland Democratic Party’s special interest constituencies—was bland and uninspiring to his base and independents. No matter how he tried to distinguish himself, he was part and parcel of the O’Malley era and Hogan made sure to remind voters of that at every turn. Martin O’Malley: Larry Hogan not only beat Brown, but also delivered a gut punch to O’Malley’s presidential ambitions. The inability to ensure his hand picked successor won in reliably Democratic Maryland will be noticed by primary voters–and donors. Ken Ulman: There was no Ulman effect. Ullman brought millions of dollars and his influence in wealthy Howard County to the Democratic ticket. Hogan won Howard by 5 points. The silver lining for Ulman is that he can always go back to greasing the skids for county developers. Justin Schall: One of the seeds of Brown’s defeat was the hiring of Schall. Personnel is policy as they say, and when Schall was brought on board, the Brown campaign telegraphed they were going to play in the dirt. Outside of managing John Delany’s 2012 congressional campaign for a seat gerrymandered for a Democrat, Schall’s track record isn’t one that will impress potential employers. John Wagner: Since the primary, the Washington Post reporter was the chief stenographer for the O’Malley-Brown machine. Doug Gansler flat out accused Wagner of basically working for the Brown campaign. There’s ample evidence to support that accusation. It was Wagner who seemed to be at the scene of all the major Brown attack angles against Gansler and Hogan. Wagner is essentially an accomplice in the O’Malley-Brown administration’s abuse of the Public Information Act to attack Gansler during the primary, and either trolled or was the recipient of trolling the Maryland Shooters message board for a hit piece on Hogan. Mike Busch: The Speaker of the House couldn’t keep Republicans from making historic gains in his chamber, and once again garnered less votes than a Republican running against him. There are now enough Republicans in the House of Delegates to make a difference in the vote for leadership. If there are enough Democrats, unhappy with Busch—we just might see a new speaker. Citizens United Haters: Anthony Brown lost despite outspending Larry Hogan by $15 million and with the aid of two Super PACs. Hogan took public financing. The Maryland gubernatorial race shows that no amount of money can change a bad message—or overcome a lack of message. The Maryland Democratic Party screamed like banshees over the Citizens United decision yet bit their collective tongue when their candidate availed himself of the very “dark money” they pretend to abhor. That Brown supporters Ben Cardin Barbra Mikulski and Donna Edwards all supported amending the first amendment to allow Congress to regulate speech reveals that Maryland Democrats don’t dislike money in politics—they dislike the opposition’s money in politics. Full Disclosure: I worked for both Change Maryland and the Hogan campaign as a consultant—and it was my honor to play a small part in the effort to change Maryland.